Start by defining managed services. You’re probably already bombarded by vendors providing outsourcing or staffing. What are you willing to let go? Letting go of what you own today will always be hard because you’ve built it and you’ve set the level of quality of service that your team delivers. And, putting that in someone else’s hands is always somewhat of a risky proposition. But clarifying what you are willing to let go of, why and how, will help you implement IT managed services effectively. Don’t just look at it as getting rid of a problem either, like discarding an old data center or an under performing service desk. Look at solving the problem. Then decide who should do the work. Focus on your core competencies. Consider outsourcing any type of commodity work, like after-hours help desk or deployment of desktops. Lastly, when defining what managed IT services will look like for your healthcare organization, determine how you will get out before you get in. If you are going to dismantle a piece of your business and farm it out, consider how you would rebuild that and bring it back in with minimal disruption if it doesn’t work out. Funding is another common challenge of implementing IT managed services at a healthcare organization. You must ensure that expenses and savings are tracking appropriately. IT projects are often funded through capital expenditures, whereas most managed services contracts may fall under an operational expense. So, your CAPEX budget may be reduced but your OPEX budget may go up. Work with your financial leaders in your organization to set the right expectations. Everybody should know that your budget dollars may shift from CAPEX to OPEX. You will only see more of this in the IT space, especially as solutions like software-as-a-service and cloud storage come into play. You won’t be buying storage as much as you’ll be renting or leasing it, or perhaps buying storage-on-demand from other vendors. You should probably already be discussing this shift from CAPEX to OPEX to make sure that your organization understands the impact. It’s not necessarily good or bad. It’s just communicating where expenses will change and how. You also don’t want to get change-ordered to death. Make sure that everybody’s got an agreement on how the managed services will function and support the organization. An effective managed services solution is more than an MSP taking what the organization is giving. It is a partnership. A partnership involves mutual dependency, predictable outcomes and executive relationships. If your organization succeeds and achieve its goals, your MSP should do likewise. Define the metrics for success and confirm that everybody understands what they are doing and how it will affect your collective success. For example, you may want to have fewer calls to the help desk because now you’re analyzing the call data and fixing the problems at the source versus waiting for the problems to occur. Monitor each person’s performance as if you were managing your own team. Make sure that they sustain your service levels. It should be a collaborative environment with accountability at the highest levels. The leader of the managed services group should just be an extension of your leadership team at IT. The relationships that you make, from the top executives down to the folks in the trenches doing the work, will affect your success. Implement a good communication plan. Manage to an outcome that everyone agrees to and understands. Measure success with well-defined metrics and data. Manage it as you would manage your own department, and position everyone for success. 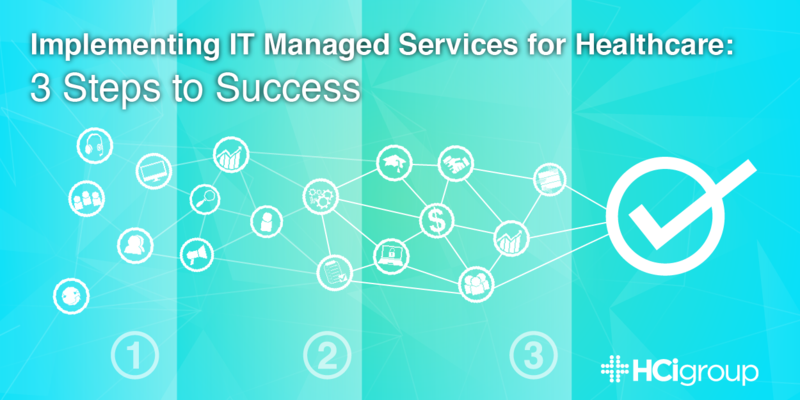 Managed IT services provides a means for keeping-the-lights on while also stoking innovation. You can reduce costs, increase efficiencies and improve care by focusing on your core competencies. But managed services IT must be implemented properly. Defining your goals, clarifying your funding and pursuing mutual success through a partnership will help your healthcare organization maximize the benefits. Contact The HCI Group if you would like to learn more about how Managed iT Services could help your healthcare organization.